In this seaside city, you can stroll the beach in short sleeves as early as March and as late as October. In winter you need only a jacket. And the sun shines most days. Just steps from its long, urban sandy beach is a historic center of flag-stoned pedestrian streets and cream-colored buildings housing cafes, restaurants, and small hotels. Walk 10 minutes farther inland, along a wide, palm tree-lined boulevard, and you’re in the city center. Here you find a wealth of shops, as well as enticing outdoor cafes where businessmen enjoy a drink and well-heeled matrons chat over coffee. On one corner, in a massive, two-story building, is a traditional market, with stalls for everything food-wise that you might want or dream of. Some blocks away is a department store, with up-to-date fashions, electronics, a food hall, and more. This is Alicante, on Spain’s eastern Mediterranean coast. With a population of about 334,000, it’s a proper city, with all amenities…including an international airport. (The sixth-busiest airport in Spain, the Alicante-Elche Airport serves many major European airlines, as well as discount carriers like Ryanair, EasyJet, and Jet2, which can fly you all over Europe at bargain rates.) 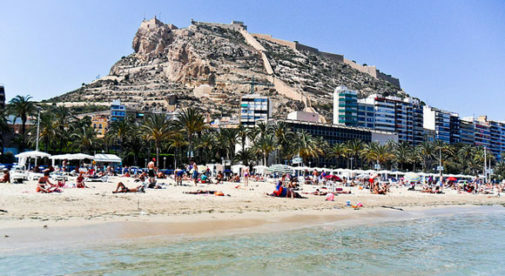 Alicante is one of Spain’s most popular tourist destinations, attracting beach lovers from Spain, the rest of Europe, and beyond. Yet despite the tourists, this remains a very Spanish city, with a friendly, welcoming, small-town feel. Away from the beach, ordinary Spaniards go about their lives, and in many neighborhoods there’s nary a tourist to be seen. It’s also one of Spain’s most affordable beach destinations. You can find apartments for sale right in central Alicante for under $100,000. For instance, one move-in-ready apartment was recently on offer right off a tree-lined boulevard that heads to the beach. The 538-square-foot one-bedroom, one-bathroom came fully furnished, with south-facing exterior views and air conditioning. It’s just a 10-minute walk to Playa Postiguet, Alicante’s most popular urban beach, and near shops and the market. The asking price: just €84,900 (about $92,050). Two-bedroom apartments under or around $100,000 are also available, though you may have to make a few trade-offs. One good example is a renovated two-bedroom, two-bathroom with 979 square feet of space. It has three terraces, parquet floors, and is very near the beach in a quiet neighborhood. The one trade-off: It’s a third-floor walk-up. But its asking price is €95,691 ($103,750). You’ll pay a premium, of course, to live near the beach. And in high seasons (the Easter Holy Week season, as well as summer) beach areas can be busy with tourists. If you’d prefer to live inland a short distance away, you can get more bang for your buck in Spanish neighborhoods of comfortable, high-rise apartments. And you’ll still be within an easy walking distance of the beach. The neighborhood around the mercado (traditional market) is centrally located, with plenty of shops as well as residential buildings, and it’s only a 10- to 15-minute walk to Playa Postiguet. In this neighborhood, you can find two-bedroom apartments for well under $100,000. What about a two-bedroom, one-bathroom, with two balconies where you can enjoy the warm Mediterranean weather? It has nearly 700 square feet of space, is a third-floor apartment in an elevator building, and is conveniently near shops. The recent asking price was just €73,500 ($79,675). You can also find larger properties on offer, including plenty of large homes with pools on the city’s outskirts and suburbs. As a major beach destination, Alicante offers a range of vacation and short-term rentals. So it’s easy to find temporary digs if you want to take your time finding your dream property.